Bertha was made to fit today's large and heavy sewing and embroidery machines. Her airlift holds a 45 pound machine and will move your sewing machine up and down effortlessly into 3 positions: freearm, flatbed and storage. We have also included the quilt leaf for the back of the cabinet. The leaf will increase your workspace behind the unit, so fragile quilts won't fall on the floor as you pass them through the machine. The leaf slides along a metal rod behind the cabinet for custom positioning to the left of your machine. 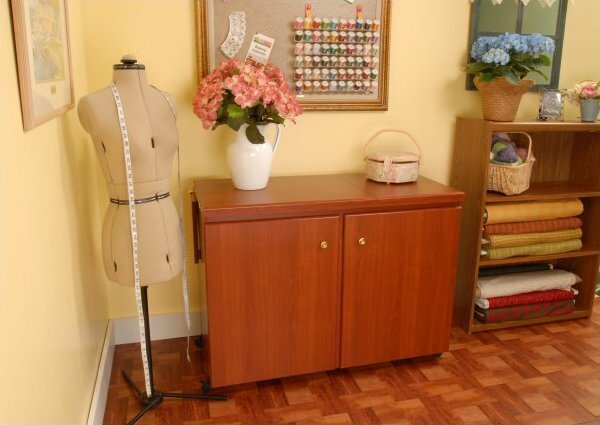 The two doors on Bertha have a total of 8 storage trays for all your sewing accessories. A cut out in the front allows for machine knee lifters to be used comfortably. Sew with correct posture avoiding stress on your hands, back and neck in any position by sitting in front of your needle for center needle sewing. Curious if your large machine will fit Bertha? The opening will accommodate sewing machines no larger then 22-9/16" wide x 11-3/4" front to back (deep) x 14-1/2" tall.